Homeless counts will take place in every county across the country beginning later this month. In this series, “Everyone Counts,” we’ll explore the importance of these counts, how to get involved in various WA locations, and hear from volunteers about their experience. Counting the number of people who are experiencing homeless in our country is a massive task. One of the most important means of getting true numbers is the Point in Time counts every January. This year, during the last 10 days in January, volunteers across the nation will collect data in more than 3,000 cities and counties in a Point in Time count of both sheltered and unsheltered people who are homeless. In Western Washington, the counts this year (2013) are Thursday, Jan. 24 and Friday, Jan. 25. The data are reported to the U.S. Department of Housing & Urban Development (HUD) for use in planning and funding. According to HUD’s One CPD, these counts are important because they tell us not only how many people are homeless, but who is homeless, and why – critical information if we are ever to end homelessness. Seattle Mayor Mike McGinn and other volunteers gather near Compass Housing Alliance in Seattle’s Pioneer Square to go out on the 2012 One Night Count, Jan. 27, 2012. Photo from seattlepi.com by Joe Dyer. 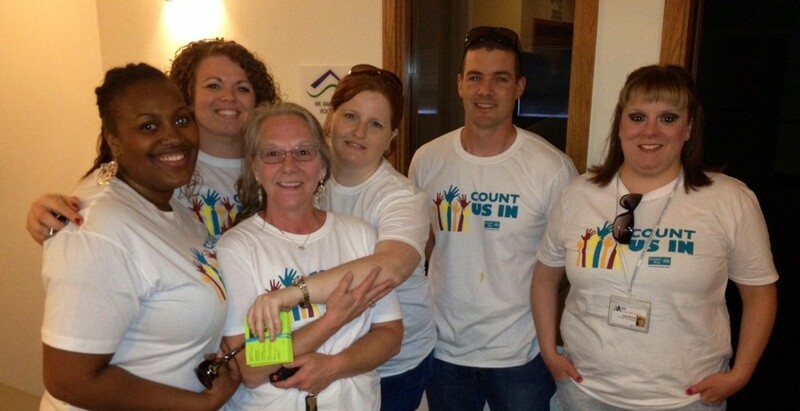 Volunteers Crucial: The counts depend on volunteers like you. To find out how to participate, find a Western Washington location below. Country’s Largest: The One Night Count in King County, organized by Seattle/King Coalition on Homelessness (SKCCH) and Operation Nightwatch, is the largest community-organized count in the country, with more than 900 volunteers on 125 teams. Daytime Counts: Outside King County’s One Night Count, the Point in Time counts are conducted in the daytime, and include interviews with the people who are being counted. Youth & Young Adults Alignment: For the first time, in King County the Point in Time Counts are being aligned with the “Count Us In” counts of youth and young adult homelessness. In 2011, during the One Night Count, only 34 youth and young adults were identified (the people counted are often asleep and not asked about their age). Later that year, Teen Feed worked with other organizations to create a new, youth-focused count. In 2012, the new “Count Us In,” conducted in daytime hours by multiple service agencies and coordinated by United Way of King County, identified 685 youth and young adults who were homeless– which may still be an underrepresentation. Cyndi’s PSA: Pop icon Cyndi Lauper, in collaboration with HUD’s “Make Everyone Count,” has recorded a PSA urging Americans to get involved in the Point in Time Counts. Here’s where to find out more about volunteering in some of the counties of Western Washington. If you have information on others, please leave it in the Comments section below. Read a personal story about last year’s One Night Count in King County on the Firesteel Blog, A Different Form of Advocacy Bridging the Gap. Operated by: Founded by Operation Nightwatch in 1980. Now operated by the Seattle-King County Coalition on Homelessness (SKCCH) with more than 900 volunteers on 125 teams. 2013 Count Dates: Friday, Jan. 25, 2-5 a.m. Volunteers Needed: Usually 800-1,000 divided into 10 different areas. The most need is areas of King County outside Seattle. Volunteers are now being assigned to a wait list. Training: Team leaders go through training before the ONC and volunteers are trained on site. Last year’s count: In 2012, volunteers found 2,594 people surviving outside, without shelter, and another 6,236 in shelters and transitional housing programs, the total coming to 8,830. Can’t do the count? Come to the next “Beyond the One Night Count,” the FREE Homelessness Advocacy 101 workshop, on Saturday, Feb. 9, 2013: Seattle from 10 a.m.–noon or on the Eastside from 2-4 p.m. Register here. Volunteer Stan Orr during the One Night Count in Seattle’s International District/Chinatown. Photo by Erika Schultz in the Seattle Times, Friday, Jan. 9, 2010. Operated by: United Way of King County and multiple service providers. Established 2012. Volunteers Needed: As of Jan. 13, to work check-in desks in Seattle Public Library locations. Training: Monday , Jan. 14, 2013, 3 – 4:30 p.m., Chinook Building Room 126 (401 5th Ave., Seattle, 98104) OR Tuesday, Jan. 22, 2013, 10:15 a.m. – 11:45 a.m., Foster Library, (4060 S. 144th St, Tukwila, 98168). Alternatives may be available; contact United Way, below. *Staying outdoors, unstably housed or at risk of homelessness. The majority of clients were female. Source: Count Us In 2012 Update. Can’t do the count? On Thursday night, Jan. 24, local organizations are hosting a Count Us In Meal at locations that serve youth. One example: YMCA Center for Young Adults on 24th Ave. S. in Seattle. Contact Parisa Ghebleh for more information at 206-749-7596 or pghebleh@seattleymca.org. Operated by: Pierce County’s Department of Community Connections and Tacoma-Pierce County to End Homelessness. Now in its 17th year. Prior Training: Mandatory trainings the evenings of Tuesday, Jan. 15 or Wednesday, Jan. 16 in Tacoma. Last year’s count: Volunteers collected data from nearly 2,000 homeless individuals, including 374 families with 752 children age 18 and under. Can’t do the count? Donate personal items such as clothes, blankets, sleeping bags, and more at Catholic Community Services, Phoenix Housing Network at 7050 S. G St., in Tacoma, 9 a.m. – 3 p.m. Monday through Friday. Read a personal story about last year’s PIT in Snohomish County on our Firesteel Blog, Point in Time Count. Operated by: Multiple service providers including YWCA Seattle I King I Snohomish, Housing Hope, Catholic Community Services of Western Washington, and Volunteers of America-Western Washington. Volunteers Needed: You can help this year by volunteering just 3 hours of your time between 8am and 8pm. It’s easy and fun! Volunteer opportunities include interviewing homeless households, homeless advocacy and entering survey data. Training: Complete training and all supplies are provided day of, along with snacks and drinks. Last year’s count: The total estimated count for all of Snohomish County in 2012 revealed 2,382 homeless individuals in 1,401 households. What about people outside King, Pierce and Snohomish Counties? If you have information about your local count, please leave a comment.